Coulomb’s Law states that whenever two charges are kept in a system, they exert an attractive/ repulsive force on each other. Is it necessary to have two charges, to repel or attract a charge? What if only one charge is present in the system? Scientists after working on so many experiments and fundamentals introduced the concept of electric field in order to answer above questions. Consider a system, in which charge Q is placed at the origin (0) and the another charge q is placed at a point P. The distance between OP is ‘r’. As usual, there will be some force of attraction/ repulsion between two charges. Suppose if we remove charge q which is placed at P, from the system. Now there are two possibilities. 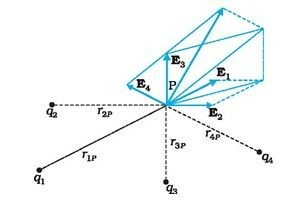 If we say there is nothing placed at point P, then why does charge q feels a force when again placed at P.? That means there is the presence of some force or field which pushes the charge q when placed at P. This proves the presence of electric field produced by electric charge Q. Whenever a charge is placed in an electric field; it experiences an electric force on it. The force felt by a unit positive charge or test charge when it's kept near a charge is called Electric Field. The electric field is also defined as the region which attracts or repels a charge. The electric field is a vector quantity and it denoted by E. The standard unit of the electric field is Newton/ Coulomb or N/C. This proves electric field is actually the force between a unit positive charge (+1) also called Test Charge. The concept of field was first proposed by Faraday, later on, it became the central concepts of physics. If the electric field is positive, then its direction is radially outward, and if the electric field is negative, then its direction is radially inward. The electric field is also called Electric Field Intensity or Electric Field Strength as it determines the strength of electric field. Example: A charge q of 2 C is kept stationary in a system. What will be the electric field produced by the charge q at a distance of 3 meters from it? Therefore charge q will produce electric field of magnitude 2 × 109 N/ C in radially outward direction. We can find the force of attraction/ repulsion on a charge q placed in an electric field which is produced by charge Q, with the help of unitary method. 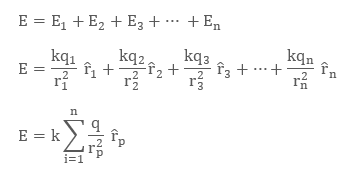 Since the electric force on a unit positive charge is (+1), is E, then electric force on charge q will be q multiplied by E, that is, qE (by unitary method). The charge Q which produces electric field is called Source Charge and the charge q which tests the presence and effect of electric field on it is called Test Charge. What if more than one charge is present in a system? Will the electric field be same as in the case of one charge? The case is quite similar to electric force due to multiple charges, in which we used vector method or principle of superposition to get the resultant electrostatic force. We do the same with electric fields that are take out the electric fields individually from respective charges and add them according to the principle of superposition/vector addition method. The electric field due to q1 , on a unit positive test charge at position vector r1, will be independent of those of q2 , q3 …….. qn. Thus we can apply the principle of superposition to proceed further with the process. Then by the principle of superposition, the net electric field E will be the vector sum of all the individual electric fields. The above relation can be used to find the net effective electric field when multiple charges are present in a system. The true and useful significance of electric field is that we can apply the concept of the electric field when charges are accelerated (in motion).